Converted byre (cow shed) in the beautiful unspoilt landscape of Assynt. Perfect for romantic cosy getaways, The Byre is an ideal base for enjoying the area’s breathtaking scenery, many outdoor activities and exceptional food. Join us on our Highland croft, worked by our family and its previous generations. 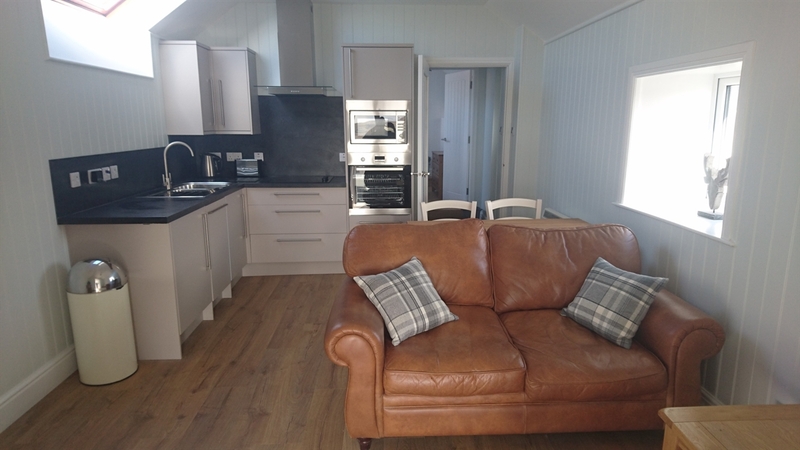 This converted byre has been modernised to a high standard by us and is comfortable and well-equipped with a new bathroom, kitchen, double bedroom, sun-lounge with a wood-burning stove and WiFi. There is also an outbuilding next door with a utility room and drying facilities and your very own red telephone box. In the North West Highlands, amidst dramatic mountain scenery and deserted sandy beaches, Assynt is an idyllic holiday retreat. 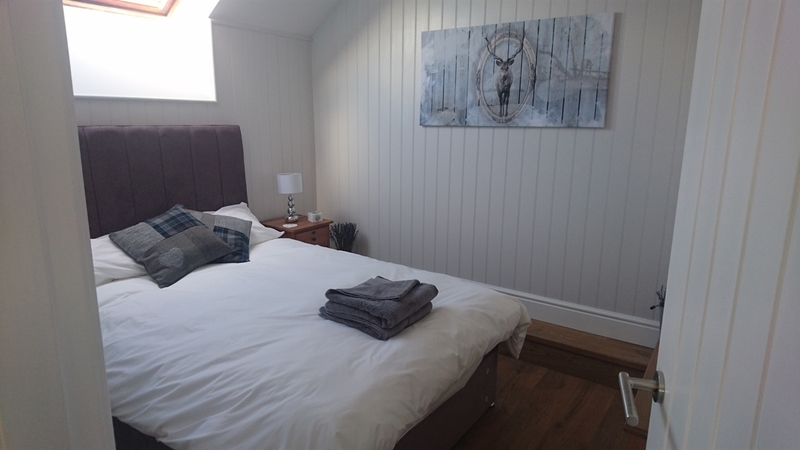 The location of the cottage is perfect, being a relaxing escape but with lots to do on the doorstep and only a short drive away from the village of Lochinver where there is a good range of amenities and excellent dining opportunities, including a Michelin-starred restaurant. There is also a small convenience store in Clachtoll, only three miles from the cottage. Set on the coast, there are beautiful sandy beaches where you may be the only visitors as you gaze out to the Western Isles. Stoer Head lighthouse and the Old Man of Stoer, a dramatic sea stack, are situated a couple of miles from the cottage. The North West Highlands Geopark, Knockan Crag and the Bone Caves, where polar bears, reindeer, lynx, arctic fox and wolves once roamed, are also within easy visiting distance. Due to the wide variety of habitats and unspoilt landscape, Assynt is a haven for outdoor enthusiasts. Take a boat trip porpoise, seal and minke whale spotting; or visit the internationally important sea bird colony on Handa Island. Join a guided walk or look out for red deer, ptarmigan and golden eagles as you tackle one of the nearby Munros or Corbetts. Enjoy a stroll down to the loch below the cottage to see the remains of a historic crannog or take our boat out to try your hand at catching wild brown trout. There is outstanding trout fishing in the area. Sea fishing is possible from the nearby coast and salmon fishing permits can be obtained for the rivers Inver and Kirkaig. Whether you want to warm up after a day enjoying the great outdoors or simply relax indoors, you can cosy up with a blanket and a good book beside the wood-burning stove or watch a glorious sunset with a glass of wine. The lack of light pollution makes the area a fantastic location for stargazing and you may just be lucky and experience the dramatic Aurora Borealis. The Byre is set on a working croft, where during April and May you will share the area with young lambs and their mothers. You will therefore understand that we do not take dogs in our cottages. 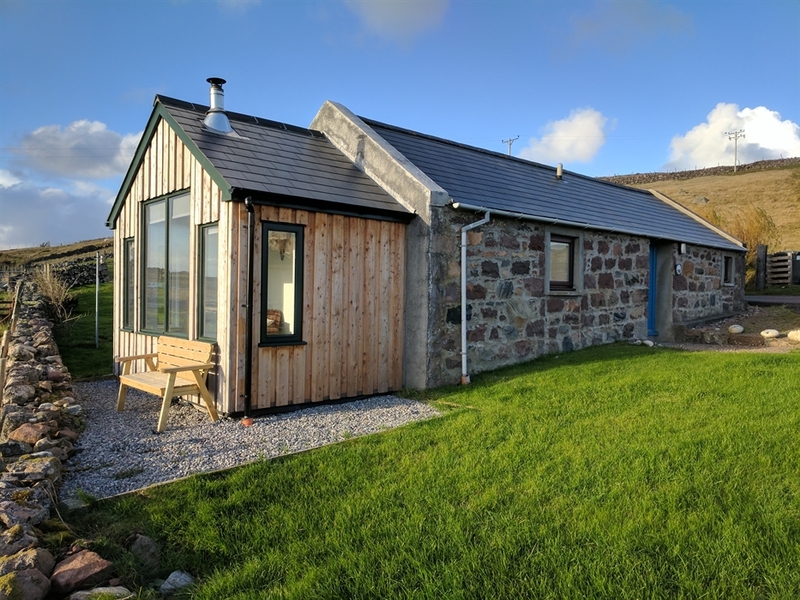 Whether you are coming to Assynt to drive or cycle the breathtaking North Coast 500, to pursue one of the many available outdoor activities or simply coming to this stunning location for rest and tranquility, The Byre will be your ideal home from home and we look forward to welcoming you.